As qualified shoe fitters we care about feet and how they are supported. Our mission is to ensure everyone has comfortable shoes and do not suffer with foot pain or other physiological pain that arises from poor footwear. We also supply comfort insoles that support and align your feet and body to help with minor foot ailments and poor posture, whether you have a high or low arch these will help! recommended by podiatrist and other medical health professionals we are here to assess, advise and give you the best possible fitting shoes. 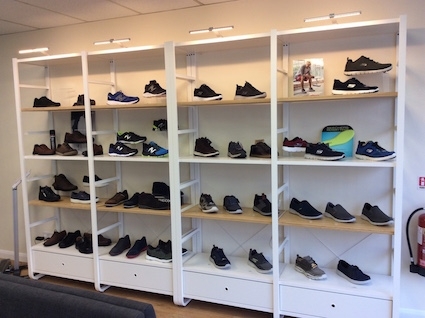 We stock Skechers, Geox, Ecco, New Balnce and DB wider shoes.